N-Tosyl-(S a)-binam-l-prolinamide is an efficient catalyst for the aqueous aldol reaction between ketones and glyoxylic acid, as the monohydrate or as an aqueous solution, or a 50% toluene solution of ethyl glyoxylate. 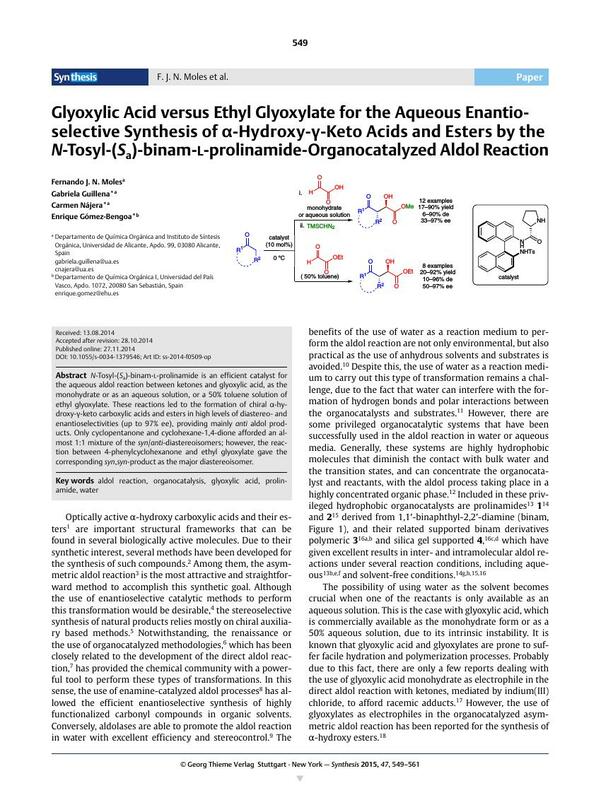 These reactions led to the formation of chiral α-hydroxy-γ-keto carboxylic acids and esters in high levels of diastereo- and enantioselectivities (up to 97% ee), providing mainly anti aldol products. Only cyclopentanone and cyclohexane-1,4-dione afforded an almost 1:1 mixture of the syn/anti-diastereoisomers; however, the reaction between 4-phenylcyclohexanone and ethyl glyoxylate gave the corresponding syn,syn-product as the major diastereoisomer. Supporting information for this article is available online at http://dx.doi.org/10.1055/s-0034-1379546. 24 CCDC 1005887 contains the supplementary crystallographic data for compound 10g reported in this paper. These data can be obtained free of charge from The Cambridge Crystallographic Data Centre via www.ccdc.cam.ac.uk/data_request/cif. 28 Supplier Name: FCH Group, Catalog Publication Date: 14 Sept 2012, Order Number: FCH1237125; CAS Registry Number: 1378713-26-8.